europa skin care: What causes hair loss? Alopecia or hair loss is the medical description of the loss of hair from the head or body, sometimes to the extent of baldness. A loss of 80 to 100 hairs per day is normal. Female hair loss has more causes and cures than male pattern baldness. That's the good news. Figuring out exactly what is causing female hair loss and how to treat it can get a bit involved. Dihydrotestosterone (DHT) is a highly active form of testosterone. DHT is synthesized primarily in the prostate gland, testes, hair follicles, and adrenal glands by the enzyme 5α-reductase. DHT is a substance in the scalp that can shrink the hair follicle until it no longer produces visible hair. Scientists believe DHT and family history are key factors in hair loss. DHT is the enemy of your hair follicles. It's what causes hair loss... not blocked follicles, not poor circulation. DHT (Dihydrotestosterone) is a derivative of the male hormone testosterone. The hormonal process of testosterone converting to DHT, which then harms hair follicles, happens in both men and women. Androgenetic Alopecia or common male pattern baldness (MPB) accounts for more than 95% of hair loss in men. By the age of 35, two-thirds of American men will experience some degree of appreciable hair loss. By the age of 50, approximately 85% of men will have significant hair loss. 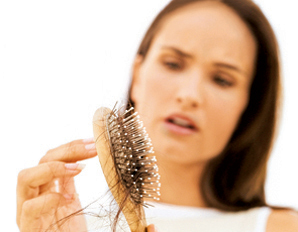 Mistakenly thought to be a male disease, women actually make up 40% of American hair loss sufferers. Hair loss in women can be absolutely devastating to self image and emotional well being. Testosterone converts to DHT with the aid of the enzyme Type II 5-alpha reductase, which is held in a hair follicle's oil glands. Scientists now believe that it's not the amount of circulating testosterone that's the problem but the level of DHT binding to receptors in scalp follicles. DHT shrinks hair follicles, making it impossible for healthy hair to survive. Thyroid Disease - Both an over-active thyroid and an under-active thyroid can cause hair loss. Your physician can diagnosis thyroid disease with laboratory tests. Hair loss associated with thyroid disease can be reversed with proper treatment. Inadequate Protein in Diet - Some people who go on crash diets that are low in protein, or have severely abnormal eating habits, may develop protein malnutrition. The body will save protein by shifting growing hairs into the resting phase. Massive hair shedding can occur two to three months later. Hair can then be pulled out by the roots fairly easily. This condition can be reversed and prevented by eating the proper amount of protein and, when dieting, maintaining adequate protein intake. Medications - Some prescription drugs may cause temporary hair shedding. Examples include some of the medicines used for the following: gout, arthritis, depression, heart problems, high blood pressure, or blood thinner. High doses of vitamin A may also cause hair shedding. Cancer Treatments - Some cancer treatments will cause hair cells to stop dividing. Hairs become thin and break off as they exit the scalp. This occurs one to three weeks after the treatment. Patients can lose up to 90 percent of their scalp hair. The hair will regrow after treatment ends. Patients may want to get wigs before treatment. Birth Control Pills - Women who lose hair while taking birth control pills usually have an inherited tendency for hair thinning. If hair thinning occurs, a woman can consult her gynecologist about switching to another birth control pill. When a women stops using oral contraceptives, she may notice that her hair begins shedding two or three months later. This may continue for six months when it usually stops. This is similar to hair loss after the birth of a child. Low Serum Iron - Iron deficiency occasionally produces hair loss. Some people don't have enough iron in their diets or may not fully absorb iron. Women who have heavy menstrual periods may develop iron deficiency. Low iron can be detected by laboratory tests and can be corrected by taking iron pills. Major Surgery/Chronic Illness - Anyone who has a major operation may notice increased hair shedding within one to three months afterwards. The condition reverses itself within a few months but people who have a severe chronic illness may shed hair indefinitely. Fungus Infection (Ringworm) of the Scalp - Caused by a fungus infection, ringworm (which has nothing to do with worms) begins with small patches of scaling that can spread and result in broken hair, redness, swelling, and even oozing. This contagious disease is most common in children and oral medication will cure it. Hair Pulling (Trichotillomania) - Children and sometimes adults will twist or pull their hair, brows or lashes until they come out. In children especially, this is often just a bad habit that gets better when the harmful effects of that habit are explained. Sometimes hair pulling can be a coping response to unpleasant stresses and occasionally is a sign of a serious problem needing the help of a mental health professional. Other physiological factors might cause hair loss. Recently, a group of Japanese researcher reported a correlation between excessive sebum in the scalp and hair loss. Excessive sebum often accompanying thinning hair is attributed to an enlargement of the sebaceous gland. They believed excessive sebum causes an high level of 5-alpha reductase and pore clogging, thus malnutrition of the hair root. Although this condition could be hereditary, they believe diet is a more prominent cause. The researchers note that Japanese hair was thick and healthy, with a small gland and little scalp oil, until the occidental habit of consuming animal fat crept into their diet after World War II. This change has led to a significant height increase in the Japanese population, but it has also resulted in more Japanese men losing hair. To some extent, their observation makes sense since problems with greasy hair have often been noted as much as six months to a year prior to when thinning hair becomes noticeable, but this might be just one of the symptoms, not underlying cause, more research is needed. Most doctors agree that if you have a oily scalp with thinning hair, frequent shampooing is advised. shampooing can reduce surface sebum, which contains high levels of testosterone and DHT that may reenter the skin and affect the hair follicle. Rogaine, distributed by McNEIL-PPC, Inc., is one of the popular treatment for hair loss in the market for years, and it has slowly gained popularity around the world. From its original inception and approval in the United States by the Food and Drug Authority (FDA), Rogaine is now being sold worldwide by the original patent holder. Rogaine works by reversing the progression of hereditary hair loss. Procerin is a clinically proven supplement made of herbal essences and helps put the essential nutrients, mineral and vitamins that hair need in order to regrow. With Procerin treatment, very noticeable hair growth is start after 6 months of application. With Procerin, hair loss is prevented without experiencing the sexual dysfunctions associated with medications like Propecia. Provillus™ is one of the best hair growth stimulants in the market which has received a high 9 out of 10 ratings from their users. Most customers can see positive results after 6 months of continuing treatment. Provillus™ contains the clinically tested ingredient approved by the FDA (Minoxidil) to help regrow hair. According to the company website, Provillus is FDA-Registered. ProFollica is one of the best hair loss treatments in the market today. It is essential to understand that ProFollica is not a single product but consists of a three tier system. It consists of a shampoo, a gel and a nutritional supplement. All the three products consist of quite a few critical ingredients. It works well in all conditions - starting from young men facing premature hair loss to menopausal women suffering from hair fall.